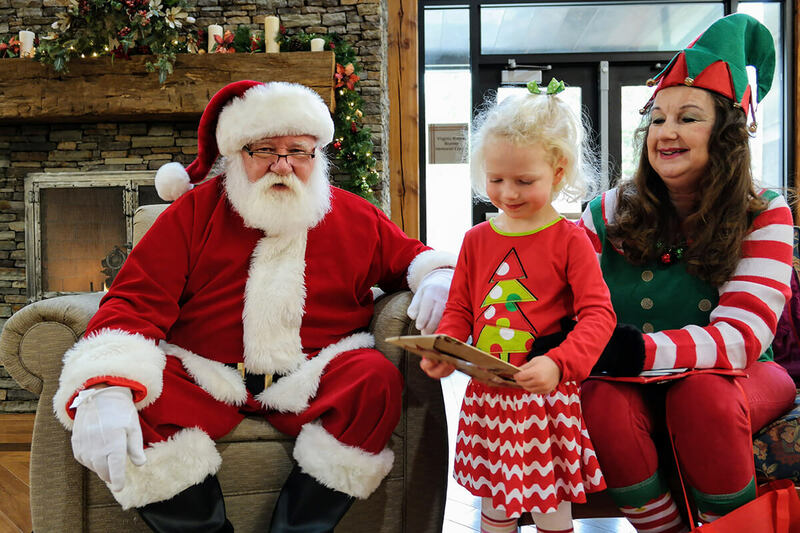 Christmas carols were sung by the fire and we were visited by Santa and his elf Tuesday morning as the Friends of the Library partnered with the Macon County Library to present a special Santa themed storytime. Children and their parents gathered in the living room to listen as Cristen Dando and Maggie Kennedy read Christmas stories. Carlyn Morenus led everyone in a few Christmas Songs and played her ukulele. Of course the main event was the visit from Santa! The children got to sit with Santa to take pictures and every child received a book as a gift. The photos were all wirelessly uploaded to one of the library’s tablets as they were taken so parents could email the pictures of their children to themselves as well as friends and family while at the event. Afterwards, the children and their families enjoyed juice and cookies in the meeting room. We would like to thank all the FoL board members for contributing cookies and juice for the event. We would especially like to thank Jean Booker for all of her time coordinating the refreshments and setting up the meeting room for the children and their families to enjoy. We would also like to thank Max West for being on hand as well.